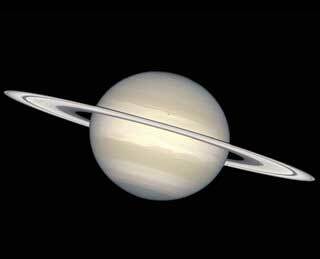 The ringed planet has long held a fascination for the amateur astronomer, with its showy rings, delicately colored bands and numerous satellites. Right now is a good time to view the planet as it presents its rings at a convenient angle for inspection. 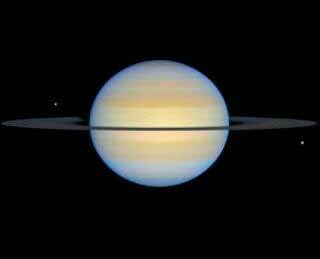 Strangely enough, the Saturnian satellite Titan may be more interesting to human beings in the short run than the gas giant itself. Titan has an atmosphere that has this in common with the air of Los Angeles - it is composed mainly of nitrogen and exhibits a bad case of smog. So bad that it obscures the moon's surface from off-world scrutiny. The upcoming Cassini-Huygens mission is designed to send a probe (the Huygens part) to the surface of Titan and report back what it finds. JPL's page on the upcoming mission. Page from NASA's planetary exploration series. Saturn factoid page with educational material and links. Part of Bill Arnett's Nine Planets opus. Natural History column by Stephen Jay Gould: Galileo and friends taught us there is more to observing nature than meets the eye. The story of Galileo's observation of Saturn framed by Gould's inimitable historical and social commentary. Science headlines news item of Feb. 12, 2002 on the history of Saturn's ring system. Reflects current thinking on the origin (and rarity) of the spectacular rings.